O Mother! How Shall I Call Thee? Of what use is my going to Kasi any more? Why Go Live By the Ganges? Who Can Explain Your Play, Mother? Why is Mother Kali So Radiantly Black? 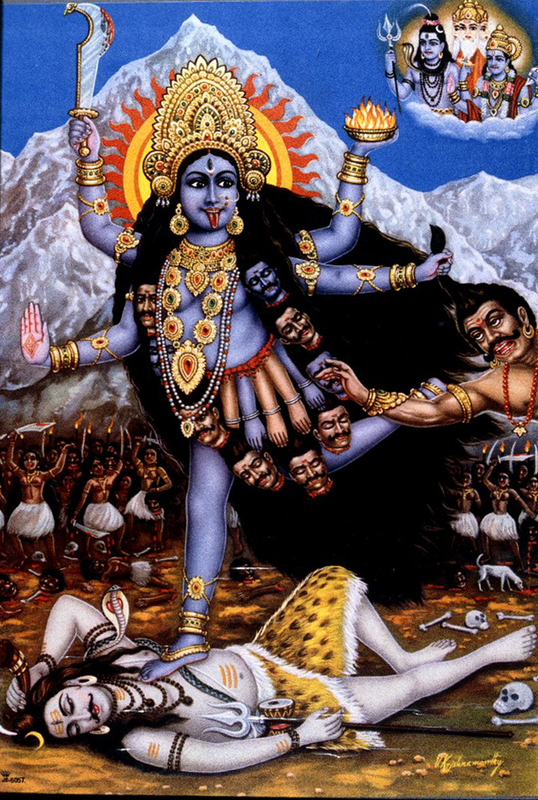 you haven’t seen how Kali is. sheep, buffalos, and young goats? ______but the Mother won’t be bribed. This entry was posted in cosmic mother, kali, ramprasad, yogananda and tagged divine mother, kali, ramprasad sen. Bookmark the permalink. Beautiful, thank you so much for this post. Divine Mother is the universe. Thousands of Suns, painting by Mantradevi based on Yogananda’s chant. Kali dancing the Cosmic dance, with awestruck girl at her feet. Stone sculpture, Gujarat, 16th century.